From beans grown in Northern Haiti, Nord’s tasting notes include butterscotch, cream, a hint of apple and banana. 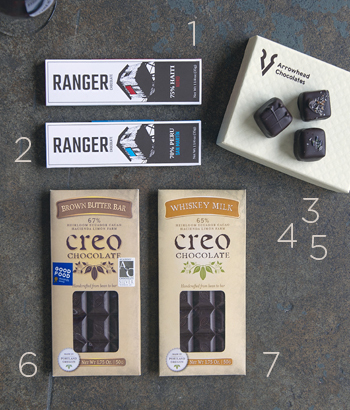 Ranger is honored to be one of the first makers in the U.S. to produce chocolate from their first harvest. Pair with PINOT GRIS. San Martín is a region in the upper part of the Peruvian Amazon rainforest. Its flavor profile is earthy yet fruity with apricot and strawberry notes, and some chili pepper, too. Pair with PINOT NOIR ROSÉ. Fresh lime juice mixed into the caramel core creates a buzz of flavor made more intense by a sprinkle of lime-fresca and habañero sea salts. Pair with CHARDONNAY. Wild Idaho huckleberries are infused with cream, a hint of lemon zest and white chocolate ganache for the center of this popular truffle, the winner of a 2013 Good Food Award. Pair with PINOT NOIR. Honey-sweetened cream ganache infused with Hood River lavender forms the center of this delicate, delicious temptation. Pair with LATE HARVEST RIESLING. This bar offers distinctive honey and toffee notes balanced with the nuttiness of house-browned butter. If you love brown sugar or warm caramel flavors, this one’s for you. Pair with TAWNY PORT. Cacao nibs are barrel-aged with local whiskey before being crafted into a creamy, dark milk chocolate. A sprinkle of mesquite-smoked sea salt on the back brings out the complex and lingering flavors, especially mouthwatering malt. Pair with WHISKEY. Ranger Chocolate is all about the bean. When you walk into its inner-eastside locale, the smell is undeniable: cacao and espresso. A collaboration with Trailhead Coffee, Cup & Bar offers both companies a chance to seduce you with their artisan products, especially Ranger’s bean-to-bar chocolates and other lip-smacking goodies — you must try the house-made savory granola or avocado toast. Patrick and Rhonda Zender with friends George Domurot and David Beanland launched Ranger in 2014. From the beginning, their focus has been sourcing beans from sustainable farms in South America, primarily Peru. The flavor profiles from the different farms are evident and celebrated in their single-origin bars, made with only organic cane sugar and cacao. In 2014, Janet and Tim Straub, with son Kevin, opened Creo Chocolate near the Rose Quarter in a quaint tile-covered 1924 building. Inside, the family operates a small café and produces handcrafted chocolates with an invitation to learn about the process during its educational make-a-bar tours — you must sign up online. Former berry farmers, the Straubs knew a bit about agriculture, so developing a relationship with a grower was high on their list when starting the venture. Janet and Kevin traveled to Los Rios, Ecuador, to meet Samuel von Rutte, a Swiss transplant, and his Ecuadorian wife, Anita. The couple grows heirloom cacao on their farm, Hacienda Limón, the main bean source for Creo’s bean-to-bar creations. When graphic designer Erica Houck began looking for a new adventure, she needn’t look too far for those who wanted to accompany her. In 2010, her dad, Bruce Reininger, a creative cook and chocolatier, and her mother, Wendy, a numbers and details kind of person, joined her in opening Arrowhead Chocolates. The chocolate and coffee shop operates with a simple mission: “to serve great chocolate and great drinks in a way that creates fun and joy for our customers and for us.” Recently sold to new owners, the Ivy family, locals with a strong tie the community, Arrowhead continues to delight in delighting customers in Wallowa County with a variety of truffles, bars and barks made from Fair Trade- and Rainforest Alliance-certified chocolate.